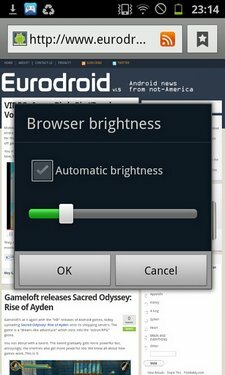 So we’ve already looked at the Samsung Galaxy S II’s very impressive 8megapixel camera, and put together a slightly meandering update about the hardware and the Touchwiz user interface that Samsung has put over the top of Android 2.3.3. 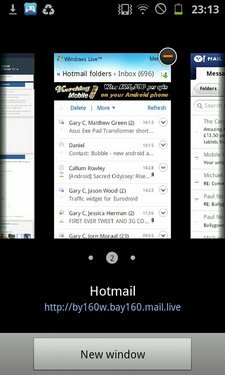 So now it’s time to finish up the review with a few shots of the supplied apps, a look at how well it works as an internet device and the eventual, inevitable summary and final mark out of ten. 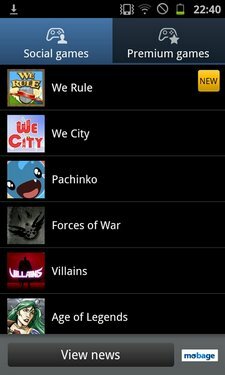 Samsung’s main original offering on the software side of things is its collection of four Hub apps – Game, Readers, Music and Social. The Social Hub is pretty terrible. It’s a basic-looking network aggregator, that, very slowly, pulls in status updates from Twitter, Facebook, email accounts and any SMS messages you have. It’s unbearably slow, but might be of use to those who heavily use messaging services. It supports Windows Live Messenger and Yahoo! so is at least pretty well featured. 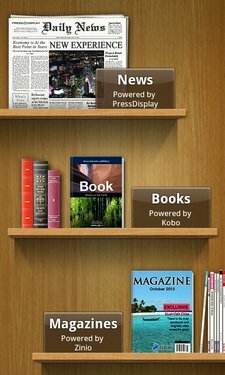 The Reader Hub app is a stylised book, magazine and newspaper shop. 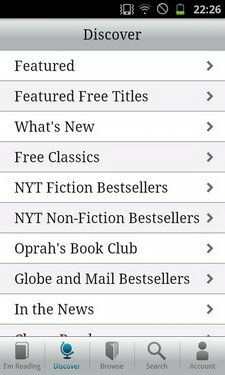 This is basically a graphical front-end that brings together a few online retailers, using Kobo as its book shop, Zinio for magazines and PressDisplay for providing very nicely formatted digital newspapers. The Galaxy S II’s enormous screen is ideal for reading on, and we were able to download a few freebie samples to check out the service. 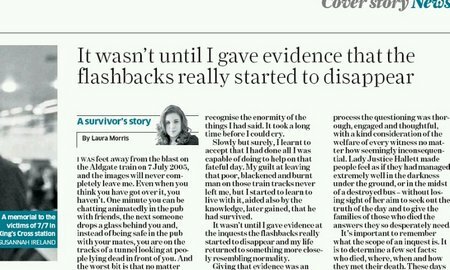 Newspapers appear in their original page layout. They look great. 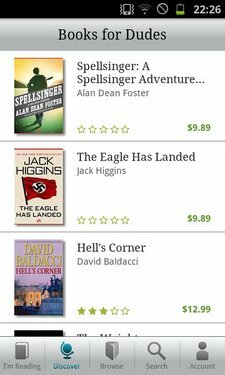 Books are rather pricey, but there’s a standard collection of out-of-copyright classics up here for freeloaders. Magazines! We got a free copy of man magazine Esquire. We idly browsed through it, but we would not appear to be within it’s target demographic. Who dresses like that? No one up here, that’s for sure. It’s a very impressive service, made all the more useful thanks to the phone’s powerful processor and big screen. We doubt magazines would be quite as impressive running on the X10 Mini. 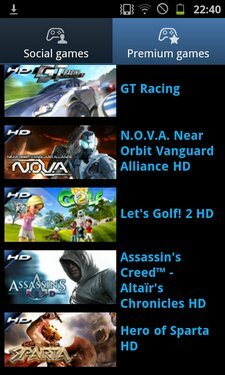 The Games Hub is “powered by Mobage” and currently provides a poor selection of casual games and access to the Gameloft back catalogue. Probably best to remove the icon and forget about this one. Finally, the Music Hub is a proper shopping experience. Powered by 7digital, it comes with access to a vast supply of music to buy. Tracks can be previewed before buying and you’ll need a 7digital account to sign in and pay for things. It’s a good, straightforward solution if you like doing your music-getting through legal channels. 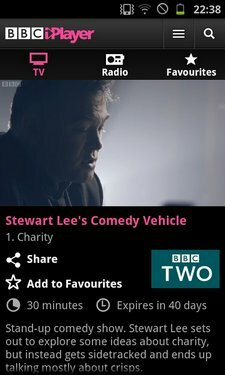 iPlayer works well on the Galaxy S II. We were able to watch all of the three programmes we bother watching. No obvious glitches or compatibility issues. Video playback of downloaded material is absolutely sensational. 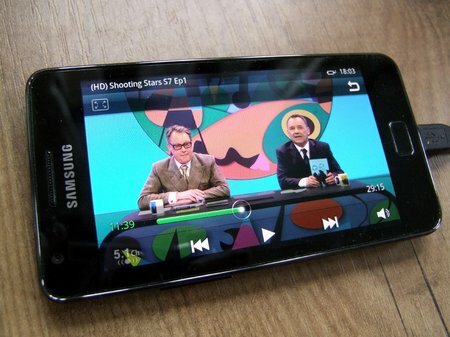 The Galaxy S II managed to play an HD 720p MKV file perfectly, and you can’t ask for more than that of a telephone. It’s mind-bogglingly powerful and versatile. The power of the dual-core processor is also reflected in the web browsing speed. The Galaxy S II is as fast at rendering and downloading pages as a laptop. Scrolling is incredible. If you’re a serious mobile web user, this phone is an essential purchase. As we saw in the little HTC Desire S, there’s also some great pinch-to-zoom functionality in here. 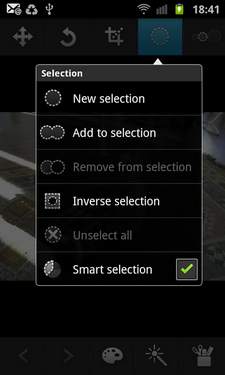 Pinching the screen brings up a thumbnail of open browser tabs, which makes managing web sessions much more enjoyable. And you can specify a separate browser brightness level. 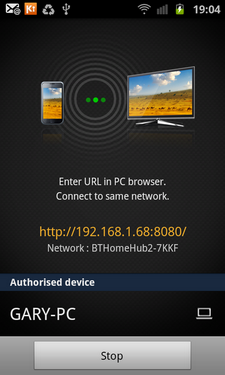 …you can wirelessly connect to your Galaxy S II via a web browser, as long as both machines are connected to the same home network. It’s possible to manage so many things from this window. 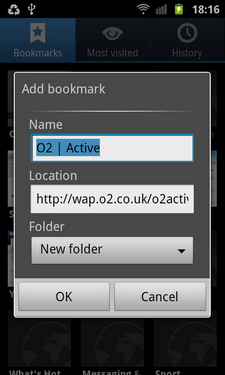 You can manually add bookmarks, download all your photos & videos, or just watch videos in a streaming browser window. 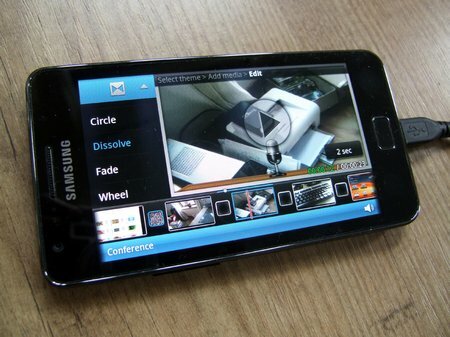 Elsewhere in Samsung specific apps, there’s a simple, drag & drop video editor for piecing together clips. 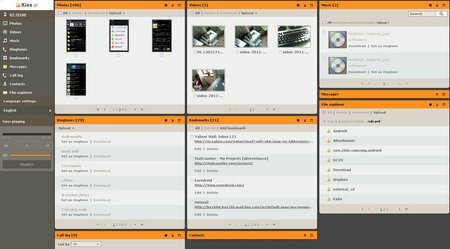 It features visual themes, has a few transition effects for cutting between clips and, once finished, you can export the clip and share it via the traditional Android share menu. It only manages 720p footage, mind. Same with photos, via the Photo Editor, which features a surprisingly complex set of editing tools. 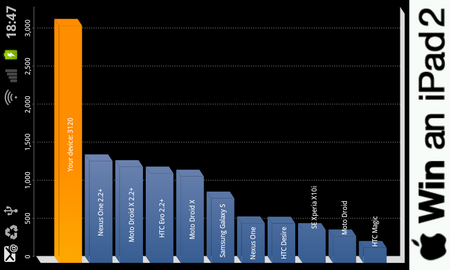 Oh, and here’s a benchmark for the benchmarking massive. Feels pretty good to have something this powerful in your pocket. Makes you feel more… confident. More… attractive. The summary before we go mad. 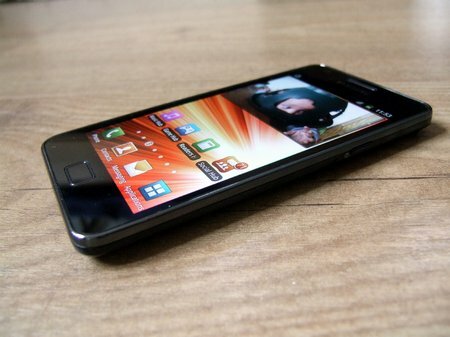 The Galaxy S II is a fantastic phone. As you no doubt already know. It obliterates everything. Here’s our official end result. So thin and light it defies belief. We’re not so keen on Samsung’s bland external design of the handset, but internally it performs better than anything else out there right now. 1080p video is sharp and smooth. The Super AMOLED Plus screen bright, clear and responsive. Samsung’s Touchwiz interface is one of the simpler, less intrusive UIs around. 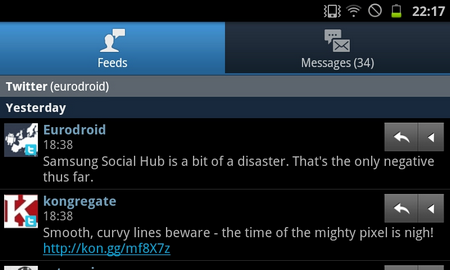 It’s pretty, it’s clear, it adds nice things to Android. 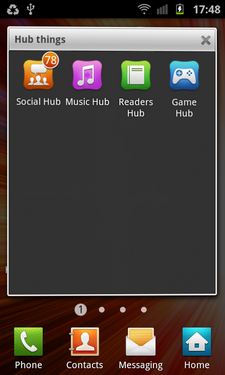 The collection of Hub apps are pretty blatant attempts to sell you things, but it’s a worthwhile trade to make in return for resizable widgets, photo and video editing tools and Google’s own proven suite of apps. Proper next-level stuff, here. It doesn’t glitch. It never pauses. Screens open before you’ve even stopped thinking about opening them. Web use is incredible while apps install and open in a flash. 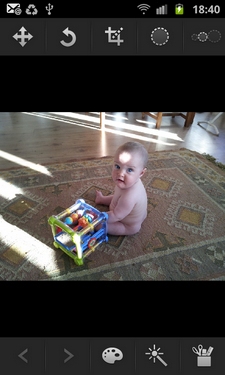 The camera’s great. The front-facing camera is great. The 4.3″ screen is sensitive and… great. It is all great. Which is very great indeed. The power is amazing. The screen a joy. The software totally glitch free. We have a personal issue with it being a little too large and slippery in the hand and a bit awkward to hold thanks to its smooth and featureless design – but that’s probably because we have small, weak, old lady hands. If you like Samsung’s minimal hardware design ethic, this is about as good as Android hardware can get. 2011’s benchmark so far. It’s very nice. Too flashy for me to use every day, though. This phone must be something. Every single review that I read has fallen in love with this thing. Even Apple zombies are having trouble not to admit it. It is a bit of a miracle. When my Desire updated to 2.2 it felt like a new level had been achieved. This one exists on a higher, previously uncharted level. Great summary Gary, and bonus points for the Stewart Lee screen grab. Can you recommend where to get one of these babys, in the UK, soonish and unlocked? Sadly O2 has stopped doing that crazy £399 deal, and I haven’t really looked around for other good value deals. Are you sure you can’t wait four and a half months for it to be annoyingly loads cheaper? And that reminds me – Comedy Vehicle Episode 2 over lunch! Hehe, well despite my vow after seeing the price of the Galaxy Tab plummet (I bought mine first week for £500), I’m getting serious screen-size envy with this lil’ HTC Desire here. I’ve still got a year to go on T-Mobile though so new contract is not really an option. Great review, I have to agree with Peach as every review I’ve read sings the praises of this phone and with an Orange early upgrade possible I’m checking there site and phoning them like a stalker. Battery wise, could you get a full day (8am – 10pm) with ‘obsessive’ use? I know I may be asking a lot. I’m glad you mentioned the design of the hardware as I remember early blurred images of this phone with a braver, sharper styling edge to it and was pretty dissatisfied with its final look. Much like the first Galaxy S Samsung seem to be looking to the iPhone for inspiration but trying to look like a close relation who’s well endowed. Some really good apps there! 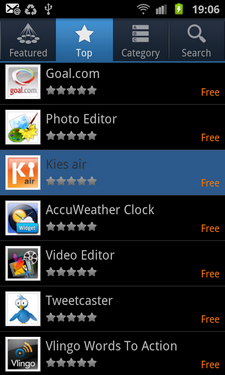 I use Galaxy S2 Apps to find great apps for my galaxy s2! Hope this helps.